Lent was long, but Easter is finally here! Although there were some posts previously written that were published in the last 40 days, I've been away from the internet that entire time. So, how did I do? It was tough, especially at first. As a blogger, it is nerve-wracking to think of walking away from regular posting, but once I was away for a few days, it wasn't so bad. I'm glad to be back. It may take me a little while to get back up to speed, but I'm anxious to get started. Stick around. A while back I heard a radio interview with Roger Ebert. 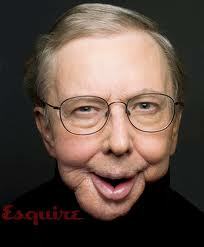 I remember Roger Ebert as the other half of the famous movie critics Siskel & Ebert. Gene Siskel died about 8 years ago, but Roger was still working as a film critic with the Chicago Sun Times and on TV after Gene's death. In 2006, he was diagnosed with thyroid cancer, which subsequently became cancer of the salivary glands and then cancer of the jaw. He had many treatments and surgeries to rebuild his face which was ravaged by cancer. The entire bottom of his face is gone and he can't speak because of a tracheotomy. He uses a computer to speak for him. He continues to suffer through other health problems, including a fractured hip in December. As I listened to the radio interview, I thought it was so sad that his life was basically over because so much had been taken from him. I caught myself and realized - hey, the guy isn't dead yet. He still writes a regular movie column and well known blog. His 2011 memoir, Life Itself, is being developed into a movie. While I was looking for pictures of iron lungs for my post about vaccines, I found this story about a 71 year old woman who lived her entire adult life in an iron lung, dying in her sleep in 2009. She was cheerful and satisfied even though she spent most of her life in an 800 pound tank. Initially, I found myself thinking her life was so tragic and wasted. Not so. Even though she was stricken with polio at age 11 (in 1948), she graduated from high school, received her associate's degree and a bachelor's degree from Wake Forest College (now University). In each instance she graduated first in her class. She was a friend to everyone in her small town, young and old, many of whom came to her home to share high school graduations, wedding celebrations and dinner parties. She appeared in two documentaries and wrote a memoir in 2003, Breath (Life in the Rhythm of an Iron Lung). I've had some time to think about my reactions to both of these stories. How dare I judge the quality of anyone's life? I just assume that someone who suffers or is disabled can't be happy living through that. My faith immediately tells me that is wrong, but I'm still struggling with it. Tonight I read a reflection on Jesus' words to his disciples: "As the Father has loved me, so I have loved you." How much better can life get than to have your Savior and friend look you in the eye and tell you He loves you as much as God loves Him? Yet each of these disciples Jesus spoke to would go on to suffer fear, deprivation, doubt and horrendous painful deaths. God's love doesn't guarantee a "happy" life, at least not by the standards I've been using. A "quality life" is not a life of good health, wealth and worldly happiness. It comes from the knowledge that life, no matter what the circumstances, is a precious gift from God that is meant to be lived for His glory. It does not rejoice over wrongdoing, but rejoices with the truth. You've heard it before - probably at a wedding, right? Funny thing, St. Paul never mentioned marriage in this letter to the Corinthians. Maybe he was talking about God who is Love. 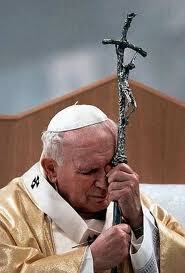 Maybe he was illustrating what it means to love our neighbor as ourselves. It's that time of year again, when the Leprechauns start doing their thing. They start digging through things, dropping gold coins everywhere and stealing shoes. 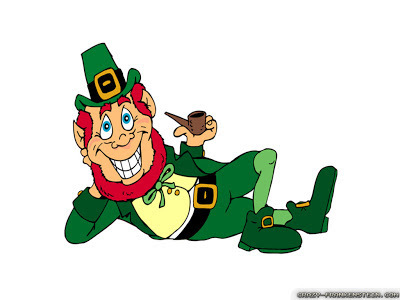 Maybe it's the green beer. Maybe it's because they're just naturally mischievous. Are the Leprechauns coming to your Happy Home? 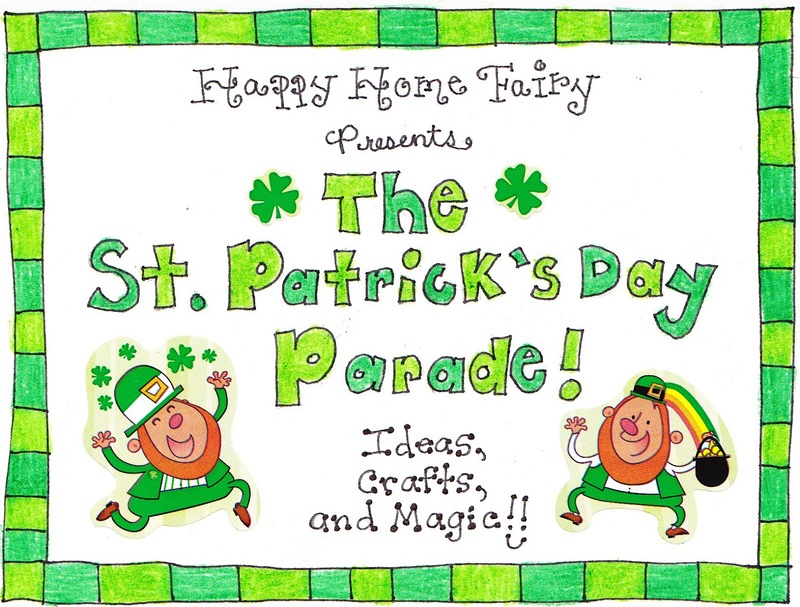 If you don't know what Leprechauns can do, or how much fun your family can have with these wicked little men, you really must visit Happy Home Fairy. There are plenty of great ideas there to introduce your family to the guy who makes the Elf on the Shelf run and hide! Decluttering is one of my personal New Year's Resolutions and because more than a month of 2013 is behind us, I should be able to report some progress. Well, it's been slow. However, I do have some encouraging news to report. Two recent situations resulted in some significant progress in the kids' rooms. First, Mackenzie announced she no longer has anything to wear. While most mothers have heard this cry from their 9 year old, in this case, it's true. I have a very hard time keeping Mackenzie in clothes. She is somewhat hard to fit, so clothes shopping is not pleasant. In addition, when I buy her items, she decides after she has worn it once that "it doesn't fit," "it's too long" "it's too short" "it's itchy" or "I don't like it". ACK! It is a huge disincentive to shopping. You can read more about how we addressed that in my recent post "What Not to Wear". Despite the fact she had nothing to wear, her drawers were overflowing with clothes. At the same time, I have a friend who called to see if Christian had some clothes he could "hand down." Yes! Christian is exactly the opposite of Mackenzie. She fluctuates in size about twice a year, while he hasn't grown much in 2 years. That has been changing for him in the last year or so as he is getting taller. Now, it seems like the pants/jeans I bought a couple of months ago are ready for the flood. Shirts, however, stick around a LONG time. So, it was time for a closet clean out for both of them. I would like to say I used the opportunity to provide my children with an educational experience in purging, but I'm just not that patient, especially because there was some urgency attached with both rooms. Also, my kids are natural pack rats (I have no idea where that came from - seriously). So I pulled out some trash bags and went to work. It took three full trash bags in each room, but I am happy to say they are decluttered and ready for some new clothes. I didn't take a picture of the "before" because I needed to get it done, but you can see what it looks like when the only clothes that remain are the ones that fit, you like and are not ruined. This experiences reminds me once again the same lesson I learn every time I declutter - you can't be sentimental or unrealistic ("I know I will use that sometime.") If you can't or won't use it now, get rid of it. Space in your home is valuable and you deserve to live in a clean and orderly space. I think I'm going to stitch that saying and hang it on the wall. One baby step at a time . 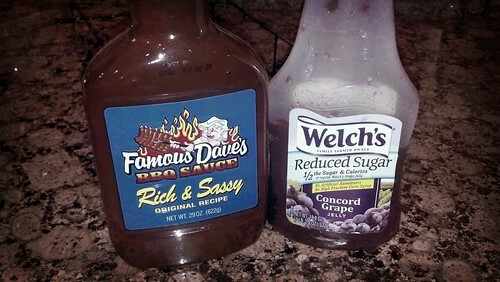 . .
Ok, this is as easy as it gets, but you will love the result, especially if you like barbecue. 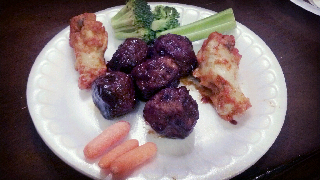 Use your favorite barbeque sauce, grape jelly (to taste) and a bag of frozen meatballs. 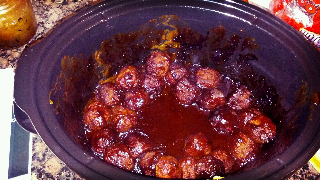 Combine in a crock pot and simmer for a couple of hours until the meatballs are cooked through. Perfect for your Final Four party! 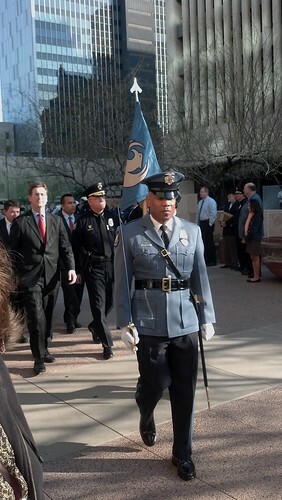 A couple of weeks ago, the City of Phoenix held it's annual memorial to employees killed in the line of duty. 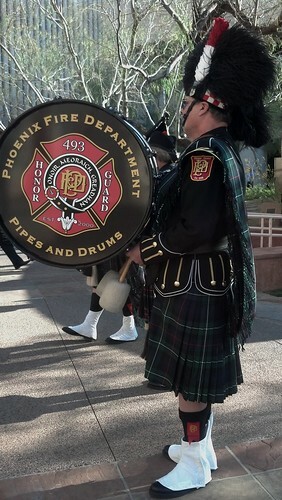 Fortunately, no employee died this year. 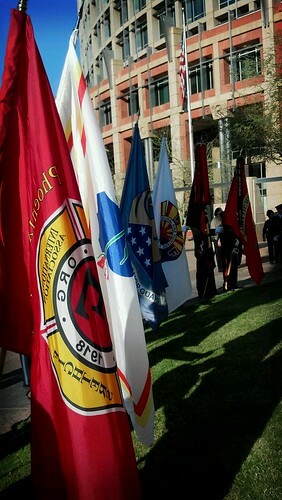 In the United States last year, 126 law enforcement personnel and 82 firefighters (39 of those volunteers) died in the line of duty. Each one knew that the possibility of death was part of the job description and each made the conscious choice to pursue their calling. 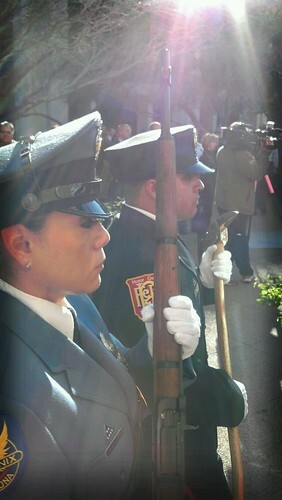 They don't do it for the money - they do it because they love serving the public. That's you and me. 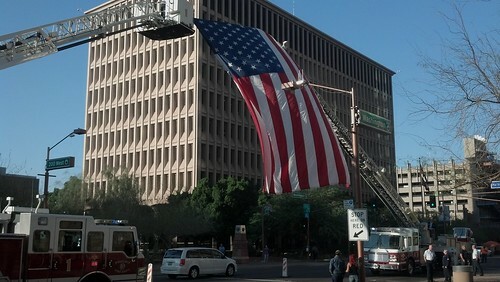 Take a minute or two today to remember these hometown heroes and say"thank you" the next time you meet one. A good woman, where can she be found? and does a good job with the kids. and always a fresh mani-pedi. and supports the admirable work of Planned Parenthood. and tries to be their best friend. and makes the minimum payments on the credit cards. and gets take-out on Monday, Wednesday and Friday. and occasionally has time to help with homework. and her husband is happy when the house is picked up. and looks 10 years younger than her age is valued. She's all things to all people. When this life is over, I pray I might be judged mercifully by God's standards. In addition to my crazy fabric stash, I have a healthy stash of yarn for crochet projects. Like the fabric, I keep telling myself that I won't buy any more yarn until what I have gets used up. 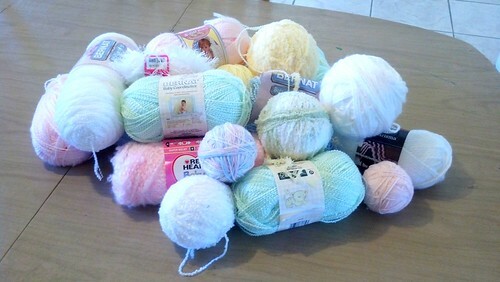 Funny thing, I swear that yarn keeps multiplying because I keep seeing more bags from JoAnn and Michaels. 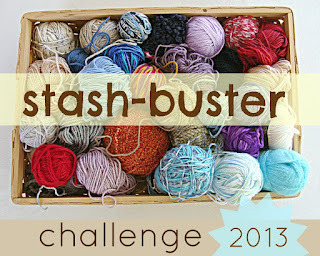 I recently found Linda's Crafty Corner and she (and many of her readers) are participating in a Stash Buster Challenge 2013. The idea is pretty simple - sign up with her and commit to working through your stash during the year. There are a lot of people already participating, and I am late to the game, as it started in January. You start with a picture of the part of the stash you want to use. You take a picture of that portion of your stash and work on getting rid of it (through projects, not Goodwill :). After you complete a project, you link back up with her and she will feature it on her blog. If you are interested in playing along, click on the picture below. It will also appear in my sidebar during 2013 if you want to keep visiting. 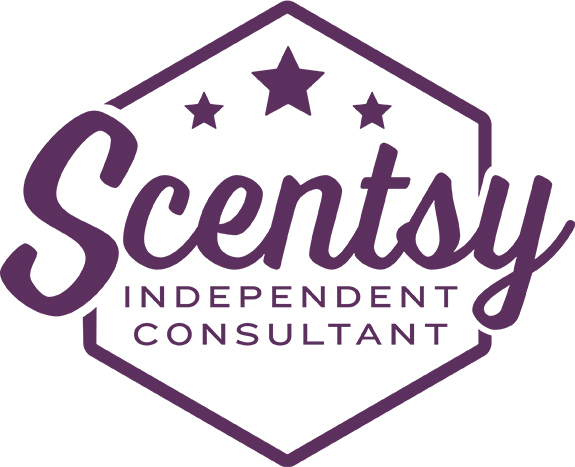 As a bonus, Linda will follow your blog and put your blog button on her sidebar. To get started, here is the stash I want to use. As you can see, it's basically baby yarns in pastel colors. I only put a sample of the yarns on the table to photograph; I have more skeins of each of these yarns. I'm not exactly sure what I will be making, but it obviously will be for babies. 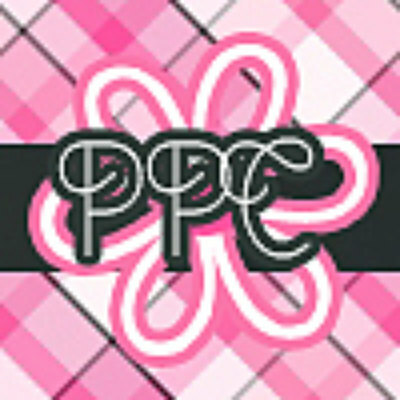 I hope to get my projects into my Etsy store, Pretty Pretty Cindy. Hopefully, I can wear down my entire stash through the year (ha ha, if you believe that). I do expect to get on to other portions of my stash so I'm not making baby stuff all year long.